Below is a collection of videos found throughout our site. These videos can also be found on BioTek's YouTube channel. Additional application videos utilizing our instrumentation can be found on Jove. The AMX Module for MultiFlo FX enables gentle automated media exchange to protect and encourage proliferation of spheroids, tumoroids and other 3D cell structures, 2D and suspension cells in microplate-based assays. 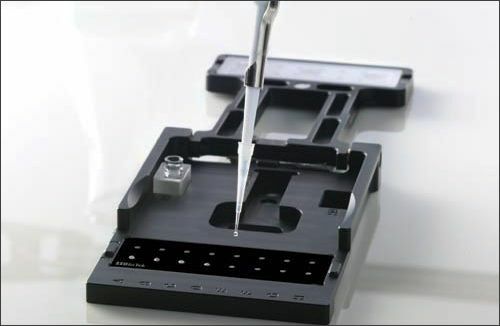 The RAD single channel dispense module for MultiFlo FX enables rapid, custom-mapped dispensing to individual microplate wells, facilitating many applications, including nucleic acid and protein concentration normalization. With Lionheart Automated Microscopes and Gen5 Software, it’s easier than ever to capture high quality images and run powerful analysis. Lionheart is available with or without environmental controls: Lionheart FX is ideal for live cell imaging workflows, while Lionheart LX meets the needs of automated endpoint microscopy..
Label-free and fluorescence cell counting is fast and easy with BioTek's Cytation and Lionheart Imagers, and Gen5 Software..
BioSpa 8 Automated Incubator links BioTek readers and imagers together with washers and dispensers for full workflow automation of up to 8 microplates or other labware. This video demonstrates how BioSpa 8 automates your workflows, from ELISA to long term live cell assays. 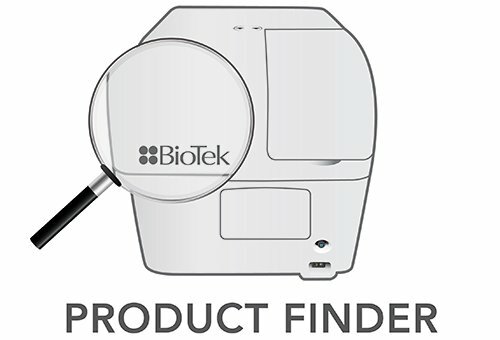 The 800 TS Absorbance Reader from BioTek brings high performance absorbance microplate reading to your laboratory at an affordable price. 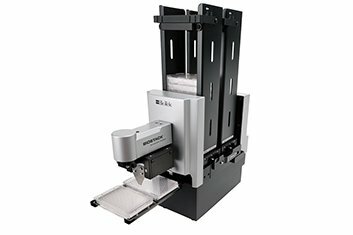 The 50 TS Microplate Washer from BioTek brings high quality automated microplate washing to your laboratory at an affordable price. 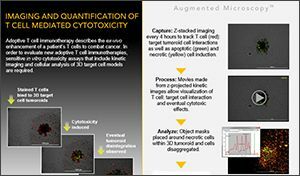 Combining quantitative microscopy and multi-mode detection into one compact unit, Cytation™ 1 is an affordable solution for a wide range of live and fixed cell, and traditional biochemical applications. 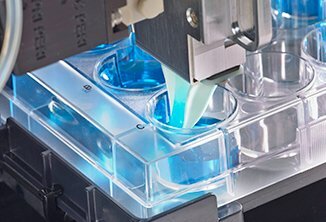 Learn how the Lionheart FX Automated Microscope's integrated design and environmental controls make it ideally suited for short and long-term kinetic live cell applications. 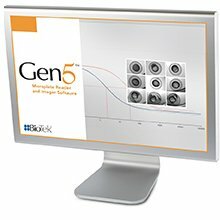 Learn more about air and oil immersion imaging with BioTek’s Lionheart FX Automated Microscope and Gen5 Software. See how easy it is to get setup with the Lionheart FX Automated Microscope and Gen5 Software. 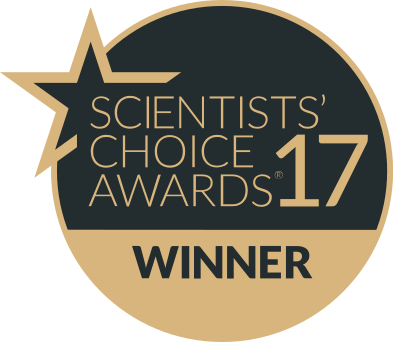 We understand that running long-term cell-based assays requires careful planning and long hours. We also understand the frustration and expense of assay failures. 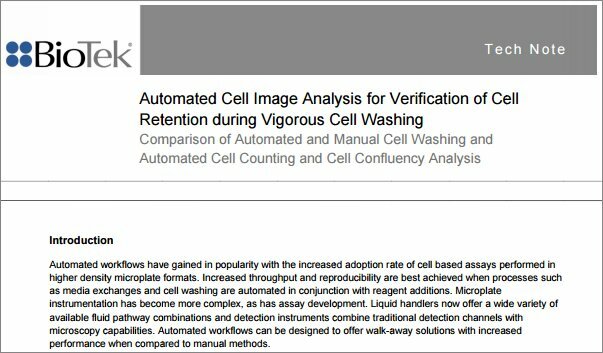 See how BioSpa 8 automates incubated assay workflows and gives you the cell-confidence to walk away. 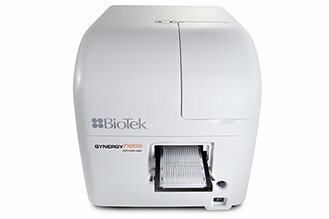 BioTek's Synergy Neo2 is the most advanced high-performance, high-speed plate reader on the market today. Cytation combines high-quality, high-definition automated microscopy and traditional multi-mode detection in a modular, upgradable instrument. Synergy™ HTX Multi-Mode Microplate Reader is a compact, affordable system for 6- to 384-well microplates and Take3 Micro-Volume Plates. 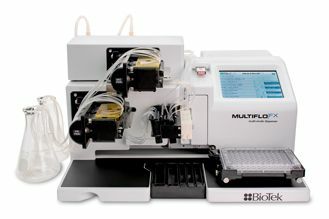 See how switching to the MultiFlo FX dispenser from BioTek can streamline your workflow and improve efficiency. 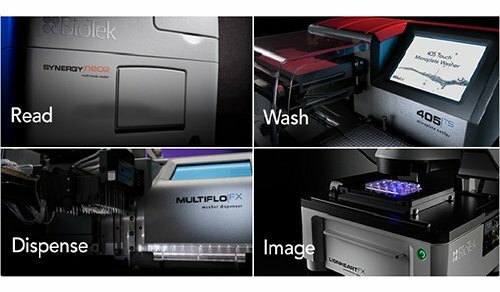 MultiFlo FX is an automated multi-mode reagent dispenser for 6- to 1536-well microplates, offering Parallel Dispense technology. The 405 Touch Microplate Washer features BioTek's patented Verify technology, which runs an automated QC check for manifold tube blockage, and visually reports any failed wells. Synergy H1 is a flexible monochromator-based multi-mode microplate reader that can be turned into a high-performance patented Hybrid system with the addition of a filter-based optical module. 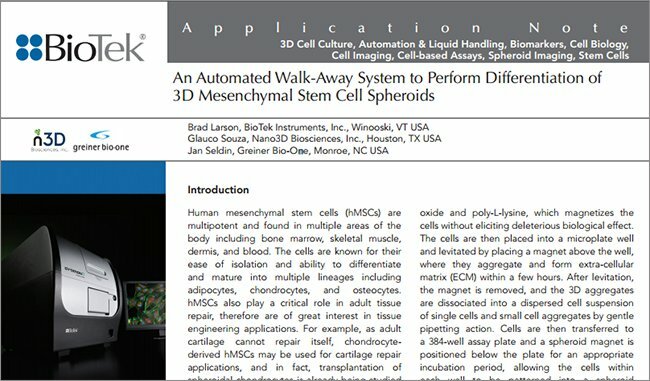 This product demo describes the use of BioTek's Take3 plate and the Epoch microplate spectrophotometer to simultaneously read sixteen 2 µL samples. 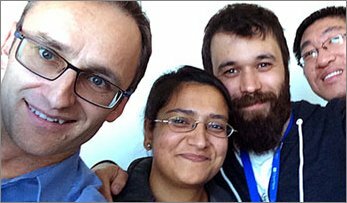 Tensions run high in this busy ... and a little bit quirky... lab, but a visit from the BioTek rep brings excitement and efficiency to the workload! This video depicts the liquid handling process steps of a typical ELISA carried out using EL406 Combination Microplate Washer Dispenser from BioTek Instruments. Here we provide an overview of the new 405 Touch Washer's touchscreen user interface. Here we provide an overview of the new 405 Touch Washer including priming the fluid path, washing a plate and sonicating the manifold. 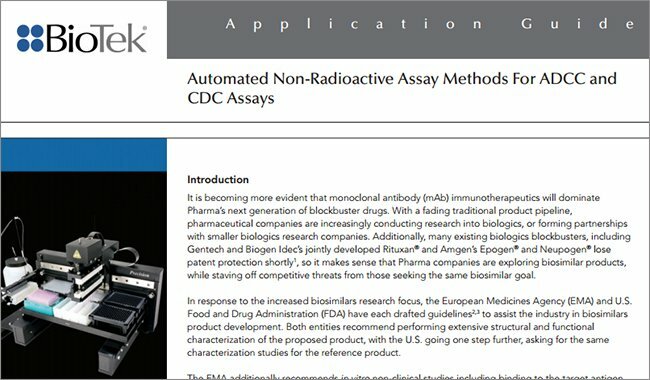 Here we describe how to create a custom protocol incorporating optimized parameters for best performance with specific assay workflows. 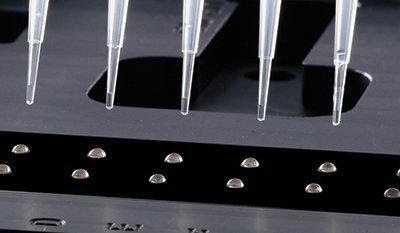 Xavier Amouretti, head of product management, Biotek, describes the Cytation 1, a third generation microplate detection and imaging platform. 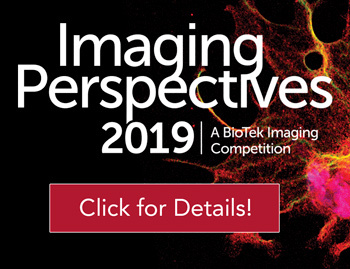 This innovative system enables cellular assay multiplexing and high-resolution imaging of cells in real time. BioTek describes the BioSpa 8 Automated Incubator, integrated with Cytation Cell Imaging Multi-Mode Reader to automate live cell imaging workflows. 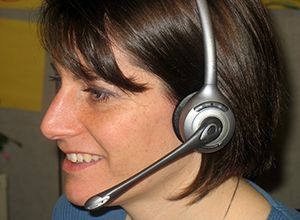 BioSpa’s new OnDemand software feature enables maximum productivity for multiple users on the system. An introduction to the Lionheart FX and its typical applications. 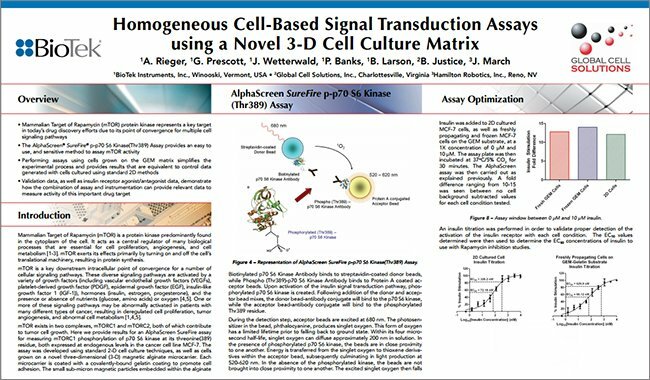 BioTek describes how their MultiFlo FX and Cytation 5 were used to compare signal transduction assay results conducted in both a traditional “plated cell” or 2-D format and a 3-D collagen-based scaffold. 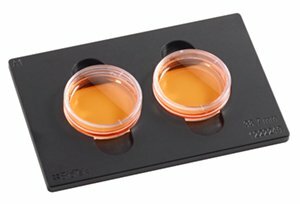 BioTek's Peter Brescia introduces High Contrast Brightfield Kit available for Imaging Instruments. 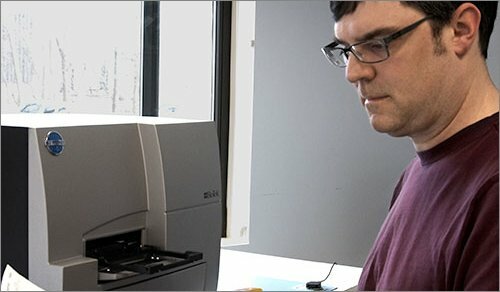 How Combining Digital Microscopy and Conventional Microplate Reading Can Help You Answer Complex Biological Questions. Lionheart™ FX Automated Microscope with Augmented Microscopy™ is an all inclusive microscopy system which provides automated image capture, processing and analysis – along with real-time annotation and built-in time lapse movie making for publication-ready images and data. Lionheart™ FX Automated Microscope Imager enables superior digital microscopy with high resolution images up to 100x. 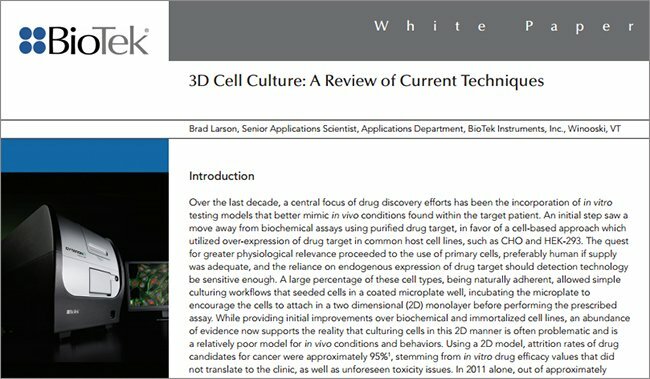 Principal scientist, Brad Larson from BioTek, discusses how combination of the Cytation 5 plate reader with Corning’s spheroid microplate range is ideal for 3D cell culture assay and imaging. Dr Arne Giebeler, Sales Support Specialist at BioTek Instruments Inc., describes how the compact Lionheart™ FX has enhanced environmental and focusing controls to facilitate multiple cell imaging applications. 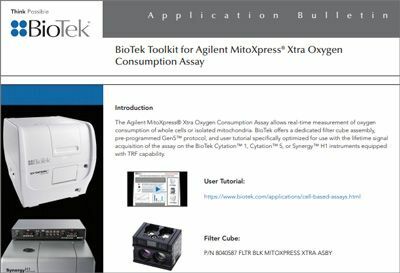 Optimize live cell assay automation with BioTek’s Cytation 5 Cell Imaging Multi-Mode Reader and BioSpa 8 Automated Incubator. 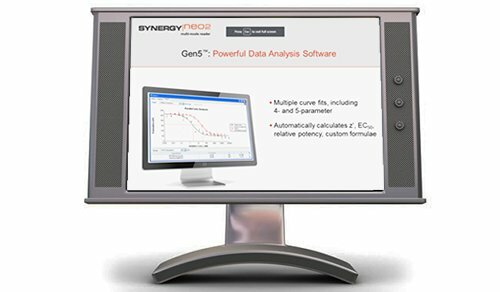 An introduction to Synergy Neo2 Multi-Mode Reader by Dr. Joel Mailliet, Product Specialist. An introduction to Cytation 5 Cell Imaging Multi-Mode Reader by Xavier Amouretti, Manager, Product Management. An introduction to Cytation 5 Cell Imaging Multi-Mode Reader by Caleb Foster, Product Manager. An introduction to Synergy Neo2 Multi-Mode Reader by Dr. Ruth Steiss, Operations. Xavier Amouretti of BioTek Instruments, introduces the company's product Cytation 3 at SLAS 2014 in San Diego, CA. 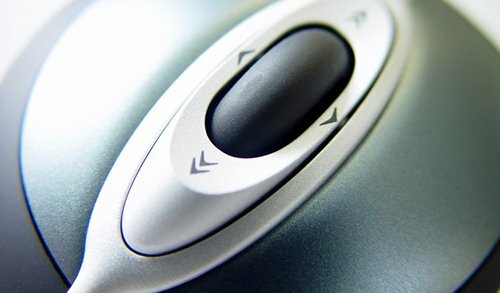 An introduction to 405 Touch Washer by Jason Greene, Product Manager. In this video, Professor Patrick Gunning discusses his work developing small molecule inhibitors for STAT proteins, with the aim of developing new cancer treatments. 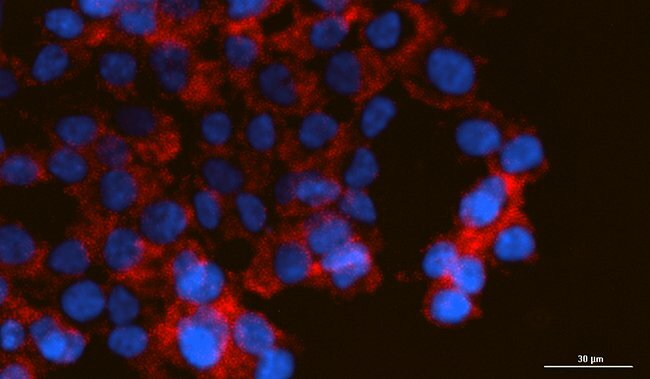 STAT-3 is found to be hyperactive in over 70% of human cancer, leading to uncontrolled cell growth, whilst STAT-5 has recently been identified as a target in haematological oncology. This video explores BioTek’s unique structure and culture. 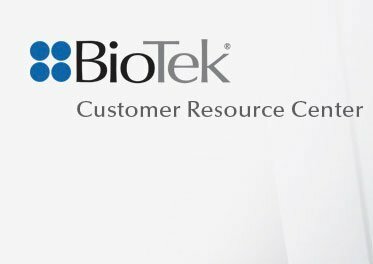 BioTek is vertically integrated allowing us to control our entire value stream from the conceptualization of a new product, through its research and development, manufacturing, and ultimately the sales, service and support of that product. BioTek’s collaborative culture fosters open, honest communication resulting in dynamic feedback loops within the company and between BioTek and its customers. 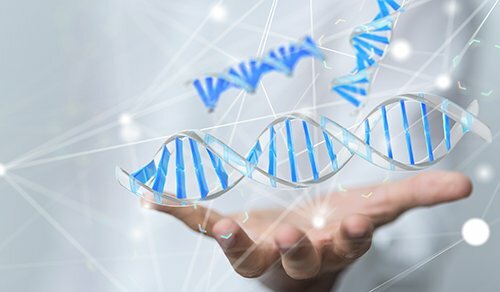 This combination of tight vertical integration and effective communication has enabled BioTek to thrive and innovate, making cutting edge research tools that are improving the quality of life for people in the world. 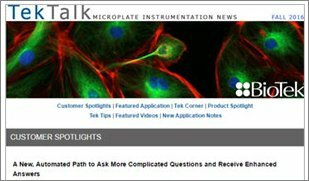 This video explores BioTek's singular focus on microplate instrumentation, and dedication to customer service. 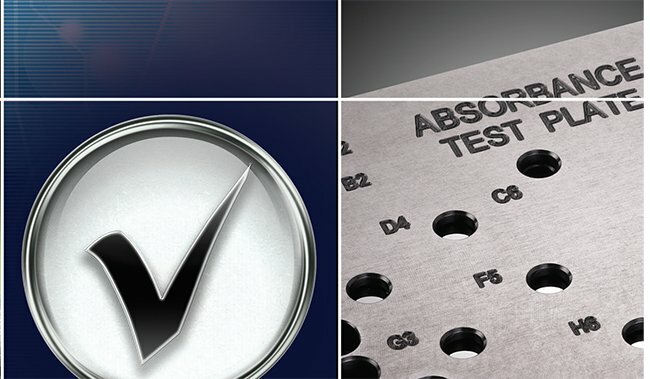 Customers cite our service and support, both pre- and post-sale, to be equally as important as the quality and performance of our instrumentation. 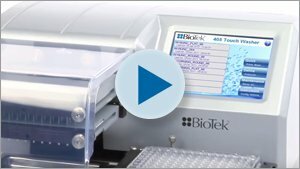 This video explores BioTek's singular focus on microplate instrumentation, and our dedication to better product design, better quality control, and helping our customers Get a Better Reaction. BioTek' s Lionheart FX has been featured on WPTZ News. BioTek Instruments, Inc., is the winner of the 2009 Deane C. Davis Outstanding Business of the Year Award. Vermont Senator Patrick Leahy visited BioTek Instruments to mark the manufacture and shipment of the 1000th Galileo Echo automated blood testing instrument. On June 27th, 2018 a group of BioTekkers volunteered at the Intervale Conservation Nursery in Burlington. Their assignment for the day? Plant trees. Lots of trees…1,836 trees, to be exact! BioTekkers have some fun as we wish you a very happy holidays! 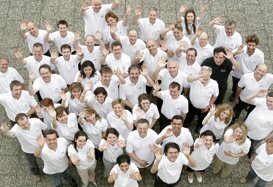 As we Think Possible to the year ahead, We’re grateful for co-workers and partners and friends. Health and happiness and plenty of rest. BioTek wishes you the very best! 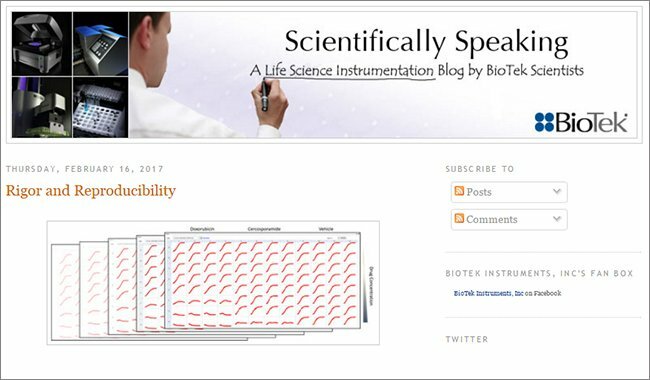 Yener Selcuk from Hannover Germany is the winner of BioTek's "Why I Need a BioTek Epoch for My Lab" Video Contest.